Lekki Lagoon is a large freshwater body to the east of Lagos Lagoon and connected to it by a narrow channel, its only outlet. Close to Lagos, it has recently come under significant development pressure and is now among the most desirable and expensive housing regions in Nigeria. It is also a major fishery, but the rapid loss of wetlands and mangrove swamps to development will almost certainly affect its productivity. Three types of canoes were in common use in Lekki as recently as 2008: dugouts, plank-built, and half-dugouts. The latter, also known as extended dugouts, have a dugout base with planks added to raise the freeboard. Of nearly 1,000 canoes counted, planked construction accounted for 54 percent, dugouts for 24 percent, and half-dugouts for 21 percent. Dugouts are made of red ironwood (Lophira alata) and range in length from 3.1 to 5.86 meters, with beam from 0.71m to 1m. Both draft and freeboard and low. Their size is limited by the available trees, which are subject to competition for other uses, such as furniture building. They are double-ended in design, and a small platform extends from the aft end, on which a fisherman stands while fishing, and sits when paddling. Propulsion is by paddle. Fire is used to hollow out the trunk to a thickness of 2.0-2.3 cm, with dry grass used as fuel. The fire softens the wood, and while it is still hot, the sides are forced outward to increase the canoe's beam, thwarts being added to maintain the shape and strengthen the boat transversely. The heat of the fire also drives out insects and other parasites, and so helps preserve the boats, which have an average lifespan of ten years. Half-dugouts are longer, ranging from 5.33 to 10.2 meters, with accordingly greater beam and freeboard, permitting larger crews and more productive fishing methods. 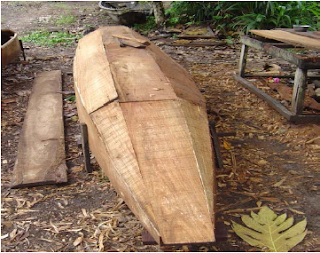 Softwoods including opepe (Nauclea diderrichi), mahogany (Khaya ivorensis) and black afara (Terminalia ivornesis) are used for planking. My source does not specify the source of the sawn lumber, or whether it is commercially milled. No frames are used, but thwarts add transverse strength. Planks are nailed to each other with "u-shaped metal fasteners," which I interpret as steel or iron staples. Outboard engines are used on 15% of half-dugouts, the rest being paddled. Those with engines have transoms; the others are double-ended. 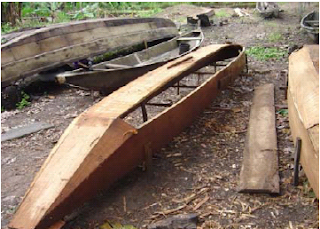 Planked canoe from Lekki Lagoon. The planks are not full-length. Plank bend in the bottom and bilge strakes is minimal, and the boat is formed mainly by angling the scarf joints to create rocker at the ends. The bottom strake is wide and straight-edged, while the end bilge planks are triangular, narrowing to nothing at the ends so that the topside strake cuves in the meet the outer corner of the bottom strake. A Lekki Lagoon planked canoe under construction, with one bilge plank yet to be installed. The canoe is apparently build on a form. Planked canoes are similar in size to half-dugouts, and use a comparable ratio of mechanical to paddle propulsion, again with transoms for the motorized vessels. Engines range from 8hp to 40hp. Plank seams are caulked with an unidentified material, and covered on the inside surfaces with sheet metal, described as "galvanized iron aluminum." Lekki Lagoon planked canoe interior. Plank seams are covered by strips of sheet metal. The uppermost planks are joined to a broad breasthook at the stern. Thwarts have yet to be added. All Lekki canoes are left in the water year-round, where the wood absorbs water and is subject to infestation by algae -- both of which make the boats heavier and slower. Canoes are painted with a mixture of cement and bitumen as a preservative. Ground pepper added to the mix as an antifouling agent, although scientific support for its effectiveness is lacking. 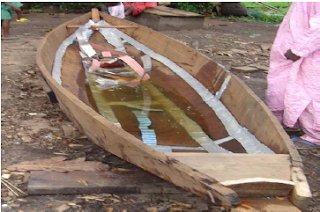 During the rainy season, canoes will sometimes fill entirely with water and swamp or sink. Sunlight causes splits and cracks to wood above the waterline. Between one yearlong study beginning March, 2006, and another conducted the following year, the number of fishing canoes on Lekki Lagoon decreased from 1,027 to 995 -- a loss of 3 percent. One suspects that the loss of fish nursery areas to development may be impacting the lagoon's productivity, and that the increase in real estate values is simultaneously displacing artisinal fishermen. Primary source: "Fishing crafts characteristics and preservation techniques in Lekki lagoon, Nigeria," by Babatune Eniola Emmanel, in The Journal of American Science, v.6, #1, January 1, 2010.